Is there a Ladies Lounge at the Bar? "I can never see why it is not considered the hallmark of success to have a brain like a woman!" 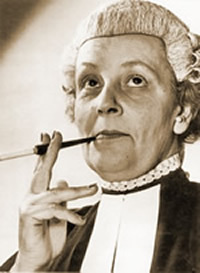 The first woman to sign the Victorian Bar Roll was the late Joan Rosanove QC. She signed as number 207 on the 10th of September 1923. Of the 47 Readers signing the Roll this evening, just under half are women – 21 of the 47. They will join the 425 women on the practising list, bringing the total to 446 – a little under a quarter of the total practising list of 1,849. Now Marilyn Warren AC QC is the Chief Justice of the Supreme Court of Victoria, Diana Bryant QC is the Chief Justice of the Family Court, there are 3 women on the High Court Bench (Susan Crennan AC QC was called from the Victorian Bar) and Pamela Tate QC is was the Victorian Solicitor General, now a Justice of the Court of Appeal; there are many more I should mention. In an earlier post I recalled the story of how when the women of the Victorian Bar sought to establish a Women Barristers’ Association they were met with the comment that maybe there should be a “Male Barristers’ Association”. But isn’t that what the Bar already is? As an aside, there is a nice part of the Vic Bar website that explores the history (herstory?) of women at the Victorian Bar, click here. So the question is this, with nearly a quarter of Victorian Bar being lady lawyers, is the Bar a good place for a woman? Are you a female barrister? Do you enjoy the work? Can you control your time and workload in an appropriate manner? Are you briefed on a wide range of matters by a wide range of solicitors? Why did you join the Bar? Let us know your thoughts. Actually, her Honour Pamela Tate is now a Justice of Appeal. But, to your questions. Yes, I am a female barrister. Yes, I love it. Yes, I can control my workload and time to suit me (and to suit my family responsibilities). The latter takes some discipline – I say no to more work than most barristers, I think. But it’s worth it for the control I gain over my life. you can always say no to work if you don’t have capacity to do it – and you can set your own view as to capacity (some barrister, mostly women, work part-time, for example, and they say no to work that would require them to be at work more than their half-time fraction). Great idea Melissa to set up this blog. Yes, I am a female barrister. But have only been so for a few days. So far so good. I am surprised, though, on almost a daily basis, about how male dominated the bar is. The readers course was sprinkled with talks from men that were full of machoism/ “war stories”. It made me think that this career may not be an easy one. So at this stage, I “reserve” my opinion on what the bar is like for women. I suspect it’s still quite hard to balance life and work at the bar. For me, the decision to become a barrister was a decision I made a long time ago. But I am aware that the challenge is not just being a woman but also being a mother at the bar. It was amazing to me how many fellow female barristers don’t even tell you that they have kids. Why is this? Is saying you have kids admitting to some vulnerability? And if so, to what? To wanting a life outside of the bar? Children? What children? You mean those who little people make up the second and third shift in the daily grind? Ahhh…. Thanks for adding your bit, and welcome to our little moment of distraction or abstraction (take your pick). Kylie, you should download the podcast of the Bar’s CLE session on work-family life, featuring junior and senior barristers and one judge – it’s not that bad, lots of great women manage kids and career as a barrister. I, for one, relish the ability to start work at 9.30 most days, after the school drop off. I’m not a female barrister, but I do have a partner who values her career and when the time comes to have a family, our ability to make it work will depend every bit as much on my ability to balance work and family as hers. That is something I thought about when deciding to go to the bar, and one of the things that made it so appealing to me. Some of what makes the bar a good choice for a man hoping to pull his weight on the domestic side is also what makes it a good career for women in general. In particular, there is not one single ladder to climb and one group of people whose convenience you work for. There are undoubtedly a lot of rigid, sexist or unsympathetic elements, as there still are in most careers, but a barrister generally has the option that many other people don’t of just getting their work elsewhere, from people who are not like that. I’d say that the degree of control you have over the volume of work is the number one thing that makes it a good job for women. You can go part time by only accepting half as many briefs. I’d recommend that anyone thinking about it watch the CPD podcast that sue mentioned above though (it’s from 23 Nov 2010 if you’re looking for it), because one big thing that came through was that control over the volume of work does not necessarily translate into control over the pace and timing of that work. It’s still hard to juggle hours in the day and days in the week. But compared to most other jobs, it’s a dream. In particular, pretty much all of the difficulties experienced by the panellists related to juggling the work itself, rather than dealing with other people’s rigidity and unrealistic expectations. That’s a very different tune to what you hear from solicitors. The panellists also mentioned how useful mobile technology is, especially mobile email, but Melinda Richards also mentioned sync as making a big difference. That’s something I’ve thought about in respect of my own particular area of focus in this “Paperless Chambers” gig – being able to zip between home and chambers with everything you need waiting for you at both ends, instead of having to lug around a laptop and a mass of folders. That sort of thing is a lot easier to set up when you work for yourself, because you’re not constrained by the work structure and IT environment of your firm, organisation or department. I tell anyone who might be interested that they should come to the bar, and especially female friends who are concerned that they don’t have the right ‘personality’ for it. At least in the bulk of civil work, what the bar needs is actually less people with a big alpha-male ‘personality’ and more people who are just intelligent, clear and organised thinkers and good at explaining things.